Violence and other crises can visit any school. 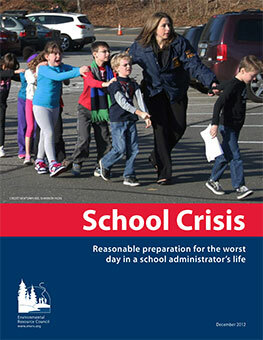 Preparing to respond to school crisis has become a key responsibility of school administrations and school leaders. The 2012 violence in Newtown inspired crisis concerns which should not define how the school district prepares its crisis response plan. It should, however, make it clear that the risk of a crisis in a school is real. Planning for the management of crisis response teams and effectively interacting with the media are two important examples of the responsible school district building a sound crisis management program. This booklet was carefully created to guide school districts in building a crisis response management program. It will integrate with many other programs and regulations designed to protect school building occupants. It also includes a strong focus on interacting with other agencies and institutions that become critical to the school during a crisis.